Home / Other / This Will Make Your Clothes Bright White And Fresh Like Spring. No Chemicals, Cheap And Easy! We welcome all those who hate doing the laundry. It is boring, exhausting, and some stains just will not go away. Plus, it is pretty hard to find a nice detergent that does not cause a fortune. Well, things are about to change here, and only one ingredient can solve all your problems. You will save your nerves, money and effort for something else. Just add a little white vinegar to your washing machine drum. We give you ten reasons to use white vinegar when doing the laundry. 1. 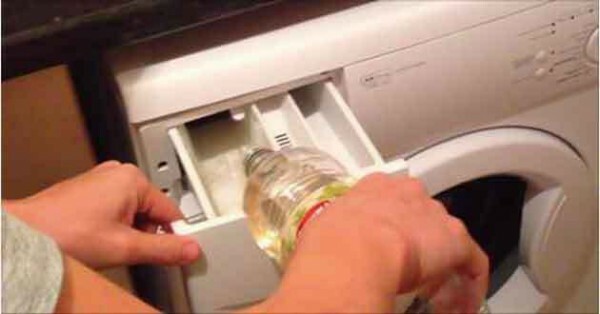 Pour half a cup of white vinegar on your clothes before you put them in the machine. White vinegar increases the power of your laundry detergent, protects the color of your clothes, and reduces any soapy residue after the washing. 2. You can also use some vinegar instead of your fabric softener. Pour it in the designated compartment of your washing machine. White vinegar provides the same effect. The only difference is that it is softer, and does not harm the environment. 4. Powder detergents leave residues on the clothes after the washing, and your sensitive skin will not like this. Add half a cup of white vinegar to your laundry to prevent this. 5. Believe it or not, white vinegar neutralizes unpleasant smells. You do not want your laundry to smell on cigarette smoke, right? undiluted vinegar essence, and rub carefully. Share these tips with others, and save your clothes from stains and unpleasant smells.